At the East Side History Club’s March 2011 meeting a number of guests talked about their connections with our local breweries and taverns. Among the guests were three daughters of Joe and Edna Matush, operators of the Trophy Tavern (1948 Atwood Avenue) from 1931 until 1967 Judy Riddle spoke for the sisters. “We all started working there when we were in high school. We had to sort the beer bottles for return.” Judy described how they got to play shuffleboard and enjoy soda and chips when chores were done. On Sundays after Mass, the sisters would have breakfast, then go to the tavern to clean, where ice cream and Borden’s milk were stored in the fridge. “It was our responsibility to bring home the milk. I’d put it in a paper bag but since it was moist, the bottom would often fall out. Dad always knew when we broke one–we tried to hide it in the bushes, but Dad always knew,” Judy recalled. Edna Matush would tend bar in the afternoons, and the sisters would wake up their dad when they got home from school–it was time for him to relieve their mother at the tavern, while one of the sisters started dinner preparations. 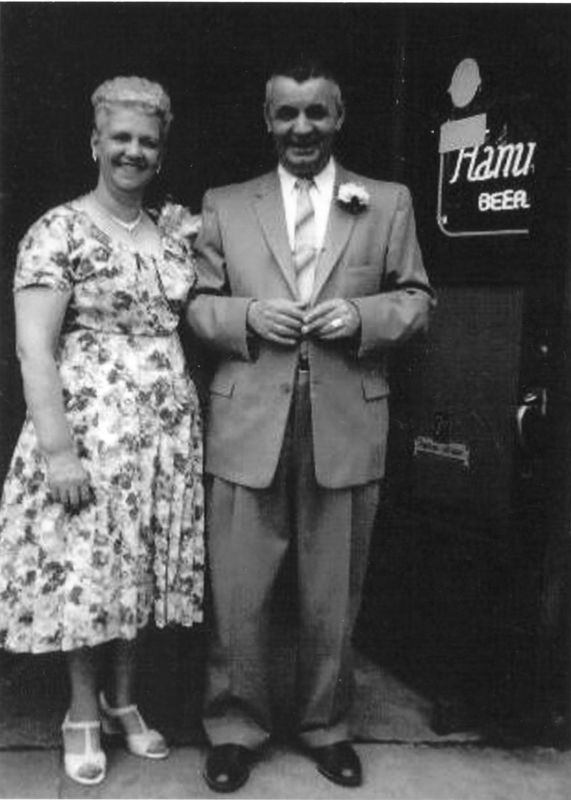 Edna and Joe Matush in front of the Trophy Tavern, 1948 Atwood Avenue, June 28, 1958. Joe Matush was a member in the East Side Business Men’s Association, and a big supporter of the Fall Festival and sports teams. The tavern would host an annual picnic at Muir Park in Poynette. “We all loved it, especially the grilled pork chops,” Judy said. The Matush family’s Trophy Tavern was known as the nicest, neatest, bar in town, and Fauerbach Beer was the most popular brew on tap. 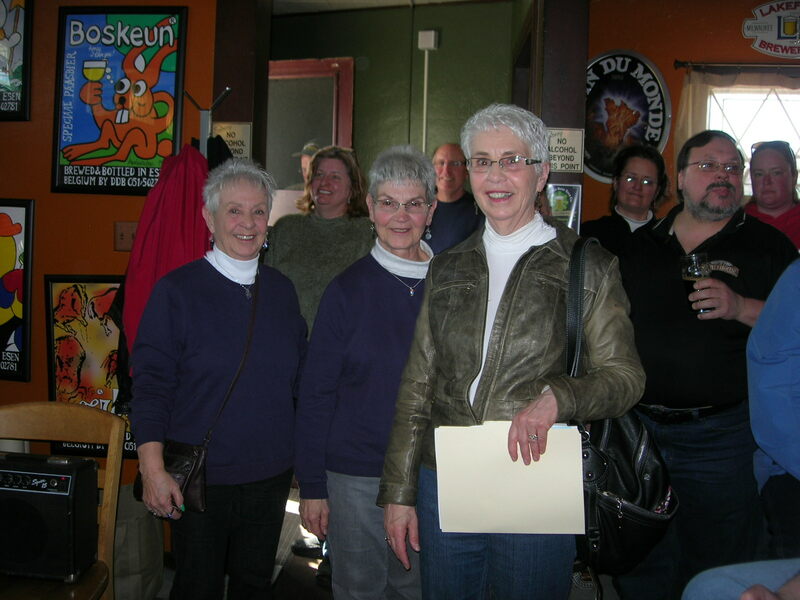 Nancy Ryan, Sue Olson, and Judy Riddle--the Matush sisters--featured guests at the East Side History Clubs March meeting at the Malt House. 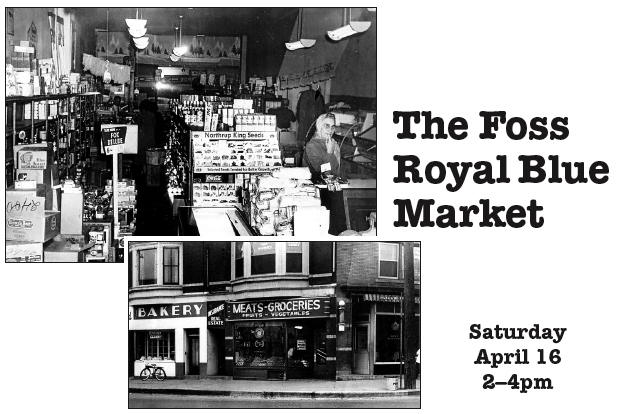 Reminisce about grocery shopping in “the good old days” at the Foss family’s Royal Blue Market. Judith (Foss) Porter has been writing a family history, and she and her brother will share stories plus photos, film clips, and other memorabilia from the grocery business located at Schenk’s Corners until August 1970. We’ll met from 2-4 pm at the Goodman Community Center. We learned about the close ties between the Fauerbach Brewery and the Hess Cooperage–Henry Fauerbach had persuaded Frank J. Hess to relocate his Chicago cooperage to Madison in order to supply barrels to the Fauerbach Brewery. The Hess Cooperage sold barrels to all the Madison breweries early last century, including Fauerbach on Williamson Street, Hausman by Tenney Park, and Breckheimer on King Street. Fritz Schlimgen tells tales from the Ohio Tavern. 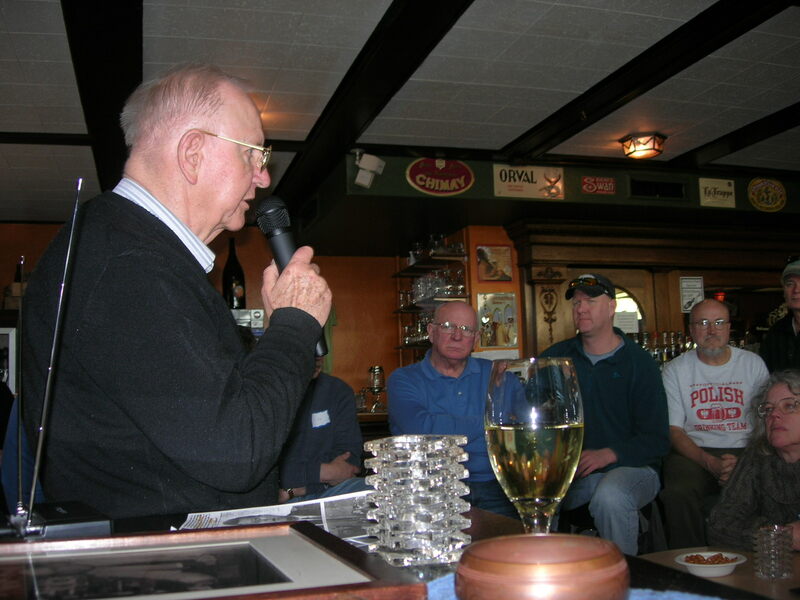 Fritz Schlimgen shared the history of the Ohio Tavern, started by his father andJohnny Zoellers and later sold to a pair of their bartenders during World War II. 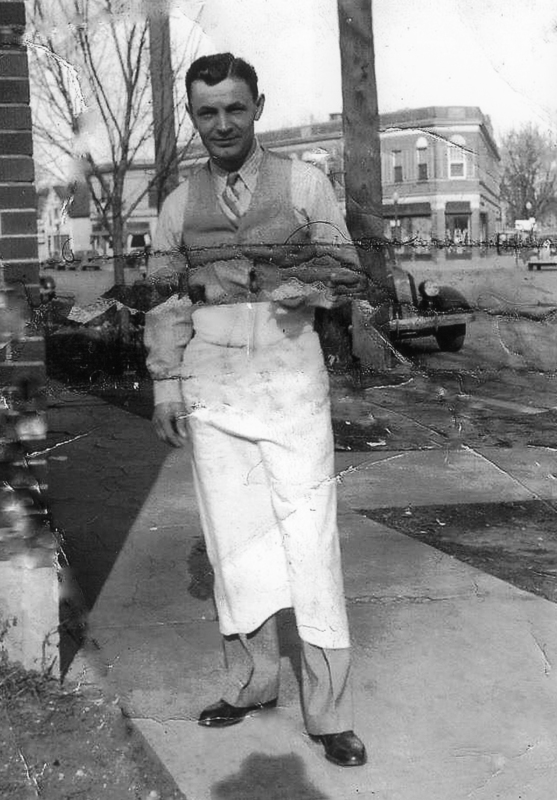 When Fritz got out of the Navy in 1946, he tended bar part-time. The Ohio had the first shuffleboard table in Madison. After Fritz and Fran married in 1947, they lived above the tavern. “We didn’t need a radio–we had the jukebox from downstairs,” he laughed. Judy Riddle described family life at the Trophy Tap, with the children working shifts cleaning and putting up decorations for holidays. “We put money in the balloons for New Year’s Eve. At midnight people wouldbreak the balloons–money flew all over. When time for spring cleaning came, we’d find the money–we were rich for young children,” Judy recalled. We learned that the Matush’s Trophy Tap was considered the safest, nicest, neatest bar in Madison by the police force. With three sisters cleaning it, no wonder! Bill Rogers ran down the 150+ years of history of the tavern at Milwaukee Street and East Washington known over the years as the Union House, Esser’s Tavern, and now the Malt House. The back bar and bar are original, dating to1858. One there was a system to drop beer bottles through a hole to a turntable in the basement for sorting and returning to the various breweries. Today, the bar has a tap system that serves up 18 fresh craft beers. Now that’s worth stopping by for a taste. 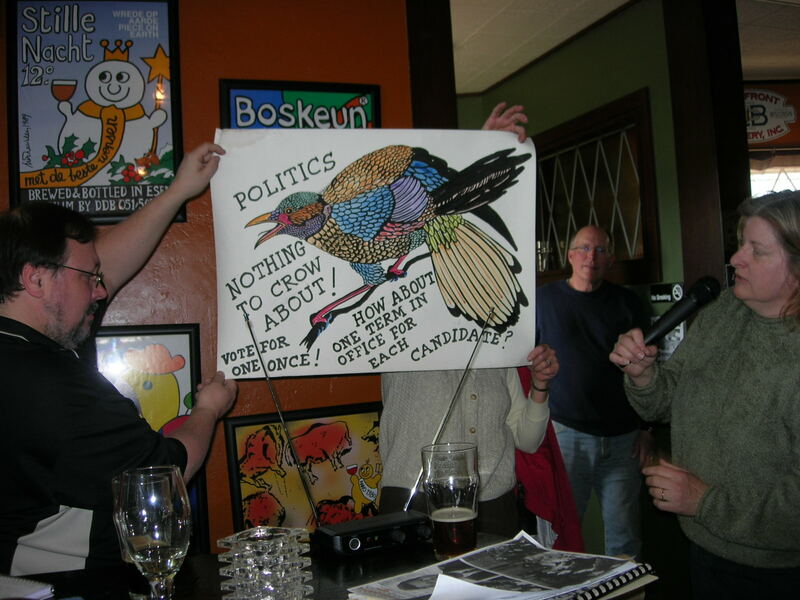 In addition, Pat Martin showed posters hand-drawn by Sid Boyum and given to various area tavern owners; these had come from the Union House Tavern. Thank you, everyone who helped make our March meeting a fascinating and sociable afternoon.